Grosset & Dunlap, 9780448461472, 48pp. Sonya Sones, author of YA novel What My Mother Doesn't Know, has written a nifty, witty take-off of The Night Before Christmas with her daughter Ava Tramer, a recent Harvard grad. This small-format jacketed hardcover takes a look back at all the stops on the route to college--touring campuses, prepping for SATs, writing the dreaded essay, getting the thumbs-up-or-down news, and finally, at long last, packing and setting off for the next chapter. A perfect gift for the college bound. Sonya Sones (www.sonyasones.com) has written five novels in verse for young adults, including the award-winning What My Mother Doesn't Know and, most recently, To Be Perfectly Honest (A Novel Based on an Untrue Story). Ava Tramer works in Hollywood. Her TV credits include The Office, The Mindy Project, and Hello Ladies. Both Soyna and Ava live in Los Angeles, California. 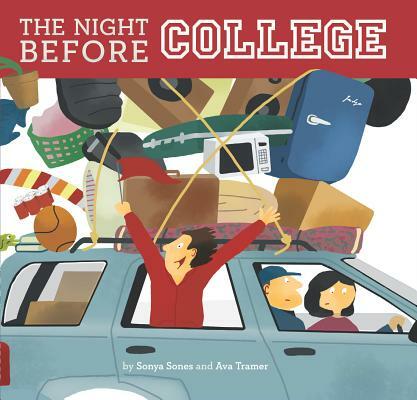 Ava Tramer is Sonya Sones' daughter and co-author of The Night Before College.